The Fulci family has returned to their ancestral home with hopes and dreams of creating a new life but little do they know on the small secluded island they once called home a madman and his followers have unleashed an ancient power beyond their comprehension fueled by the blackest of magic and the ultimate blasphemy against the dead. A rage and hatred more ancient than man has been unleashed and three people have entered a doorway into the underworld with no escape. Now the dead have risen and they will turn the entire island into a graveyard and neither the innocent or guilty will be sparred as they experience a final homecoming in Hell! 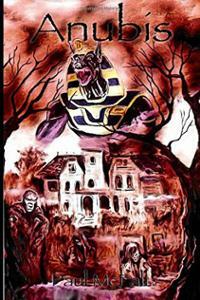 The ancient Egyptian gods worship has fallen to ruin but now the ancient rites of burial and magic have arisen and the great god of the underworld has woken and the island will become a house of the walking dead, Wreaking destruction and carnage, now only darkness awaits and no one will escape the wrath of Anubis! This intriguing debut novel by Paul Mcfall harks back to the days of graphic gore being described in a visceral way allowing the viewer to picture the horror as the author hopefully imagined it. This book is not for the squeamish but can easily be read by any fan of the genre. Clearly influenced by the works of Lucio Fulci and not disguising his love for him, Paul Mcfall brings back those maggot infested zombies that fans love so much. It is not very often in a debut novel that the characterizations are portrayed in a in depth way allowing you the reader to feel part of the journey the main character takes, but the author of 'Anubis' has done great work. If you wasn't a fan of zombie novels or extreme horror before, you may certainly be after reading this. At 310 pages long, this is one book that you will turn the pages on and not realise that the early hours of morning are approaching like zombies from a certain italian maestro's movie. I for one am looking forward to reading more from this upcoming writer, I would also love to see 'Anubis' turned into a graphic novel. a death grip. He turned and began pulling hard on his insides desperate to flee. Rick and the zombie faced off in a bizarre gory tug of war'.